This material was presented and copyrighted at the Boston SJC Workshop September 2004 and CD/MP3 of the lecture is available through SJC. The goal of this chapter is to first explain the Upapada Lagna (UL) so you understand what, how and why it represents relationship. Then learn how to interpret its significations as well as understand some traditional Vedic remedies regarding the Upapada. Finally having understood how the UL works and how it can be traditionally remedied, learn to understand it in a way where you will be able to give practical advise regarding a couple’s relationship. The Arudha Lagna is the most important (pradhāna) Arudha. The second most important Arudha is the Upapada Lagna (the Arudha of the 12th house). Upa means near or relating to (as well as giving and ornament), and is calculated from the sign near and related to the lagna and shows the person who ends up near and relating to you. How does the UL differ in interpretation from other relationship points? There are many places we can analyze for different aspects of marriage and relationship. It is good to understand the different points to be clear about what we are looking at. The karakas for relationship are Venus and Jupiter and their affliction will show blessings or curses in getting a healthy relationship or not. They also reveal overall tendencies towards relationships, it is important to see there placement in the rasi and navamsa. The Darakaraka shows the atma of the partner, shows what type of soul the person has and issues related to that level. The 7th house of the Rasi indicates how you relate to others, it is your doorway to the world and shows how you relate to the public (karaka Venus). The person you relate to the most and who reflects you the most is the love partner. The 7th lord will show the physical conditions of relationship and whether they are fruitful or barren. The A7 is connected to business partners and to sexual relations. The 7th house of the navamsa shows the skills, abilities and general nature of the partner which predominates over the 7th house of the Rasi. It will also show the partners sexual tendencies. The Upapada will show about the marriage partner or a very serious relationship. It shows the nature of the family a person comes from, it shows how the people will relate to each other, and whether the relationship will last or not and what will make it last. It will show how many children are coming from that relationship verse a previous relationship. It is important for timing marriage and its break. The UL lord will indicate the nature of the family of the partner, and therefore will often indicate the status of the partner themselves. The defining of marriage becomes very slippery and is generally given as a serious committed relationship for more than a year, but there are many variations to this. There are people who live together for a long time but lack seriousness, or people who do the full marriage process and divorce in a matter of weeks or months. The Upapada will show natural marriage not what a priest or judge might say. Two people are naturally married when the relationship reaches a level of seriousness. This is not be confused with relationships that may only be connected to the A7 (sexual attraction/ physical relationship). Old texts like Manusmriti list 8 types of marriage (ashta vivaha). Of these eight types, 4 were considered dharmic (righteous) while 4 were considered adharmic (not in line with natural order). This shows they weren’t the ways to get married but were ways in which a marriage-like bond was created between two individuals. These 8 types of marriage relate to the 8 planets other than Venus who is the natural karaka of marriage. This is important to keep in mind when seeing blessings and curses on the UL and Venus. These types of marriage are very ancient and must not be taken literally in modern times, but we must understand the essence of the marriage bond indicated by them. How can different marriages and marriage partners be differentiated? The first partner is seen from the UL, the second partner is seen from the 8 th house of the UL (UL2), the 3 rd partner is seen from the 8 th to the second UL (UL3) and so on. Often times (in modern society) it takes a few questions to determine the exact partner of reference when interpreting a UL relationship. Some people may have had only one or two serious relationships but westerners can often have difficulty determining which relationships were serious, and which were just passing flings. This makes interpretation harder and will test your skills to determine the exact person one is referring to when discussing a UL relationship. In the same way the UL is showing the marriage itself, the nature (abilities) of the 1 st partner are seen from the 7 th house of the navamsa, while the next partner is seen from the 2 nd house in the navamsa (the 8 th from the first significator). The 3 rd partner is seen from 9 th house (the 8 th from the 2 nd house). When a person has multiple marriage partners at the same time, as many Mormons do, the UL2 (the second UL) is seen 6 th from the first UL. Additional wives are again seen from the 6 th house from that significator. The 8 th house will show an end to the previous relationship. The 6 th house is upacharya, it is growing, and shows the growth of the Upapada. The Upapada is a point of giving and this shows also that the amount needed to give (expenditure) is growing. How do we use the UL in interpretation? The UL is primarily seen as the partner and the relationship itself, it is used as a lagna in and of itself. It will show qualities of the partner, their career, their family, children from the relationship, longevity, as well as fructification of the relationship even becoming a marriage. The statements of Parasara must be looked at in their essence. Here we learn that the nature (malefic/benefic) of the planets with the Upapada shows the nature of relationship. A benefic lord will make a happy relationship as will the conjunction of benefics. In general, the more well placed a planet the better the significations it will give here. The Sun supports relationship, but becoming neecha the Sun acts malefic as even the other benefic planets will do, they will not give shubha results at the same level. 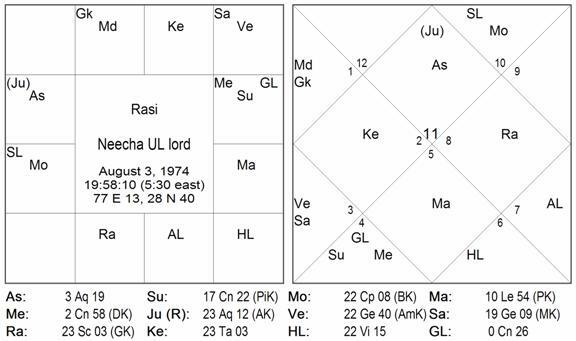 Numurologically, the the Sun is connected to the number 12, and the UL comes from the 12 th house, this is how the Sun is giving its blessings to the Upapada. The Sun also represents lineage and as the Arudha of the 12 th house shows who will help you give longevity to your kula (family) the Sun is a strong protector. For this reason the Sun is to be considered among the list of benefics. When the Sun is in an enemies sign it will have less support to protect the Upapada, and when neecha it will not help at all but instead may hurt the UL as every neecha planet will. When a planet becomes uccha it will protect the UL even if it is a malefic, as it will take on more sattvic qualitites. Though it will still have some negative attributes of that planet, while the Sun is a pure benefic for the UL. Interpretation can get specific, for example a benefic sign with malefic aspects can indicate a good person/relationship that will go bad due to malefic situations. If the UL was in Scorpio with the Moon and benefic aspects, it would show a bad person/relationship that will eventually evolve into a better situation. Always strengthen the benefics aspects or planets involved in the situation. Subha (good), Bandhat (bound too, joined), Sundari (beautiful). When the UL is joined good (benefic) planets the partner/relationship is beautiful. This is interpreted as the partner is a beautiful person (indicates beauty of character, as 7 th house of Navamsa is seen for outer beauty, chara darakaraka is seen for spiritual evolution beauty). This makes the relationship a good (beautiful) experience. The partner is happy receiving what you are giving. In this same way a malefic conjunct the UL will make the partner harsher (according to the planet and its state) and therefore make the relationship harsher and the partner is more demanding. Rishi Parasara says that an exalted UL will bring a partner from a noble family, while debilitation will do the opposite. The Lord of the UL indicates the family the partner comes from. If the lord of UL is exalted the person will come from a well to do family and will have high standards the opposite will be the case with a neecha UL lord. 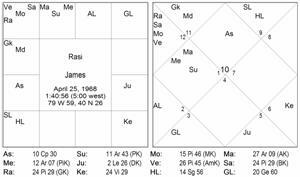 In the chart of James, he has his own Arudha Lagna lord exalted but it is conjunct Rahu and Saturn, so though he has the potential to rise to great things in life he prefers to live a simple life owning very little. He lives in a VW bus that he constructed into an incredible house on wheels. It is famous for the elaborate wood work and stained glass both inside and outside the bus. Even though he lives a simple life the main partners in his life have all come from very upper class, very well to do families, which is not his particular interest, though it is his karma. The Upapada is in Aries in the fourth house with its lord Mars and an exalted Sun. The conjunction of the UL with an exalted planet will lift it up, especially since it is in its own sign. The more well placed the Lord of the UL the higher the status of the family the spouse comes from. He is not comfortable with the relationship because the UL is 12th from his Arudha Lagna. The UL in Aries with the fiery Sun and Mars is too much and 12th from Arudha Lagna (the house of secret enemies to the Arudha) shows he will not want to put the time and energy into the relationship. Upapada fasting will be important for him. The next chart has the opposite situation. Using Ketu as the lord of the UL in Scorpio, it is debilitated in Taurus. This also puts a debilitated planet with the UL itself. The Atmakaraka was in the 7th house of the navamsa, which can make the partner more affluent. But the UL lord is neecha, and the conjunction of Rahu with the UL made the marriage partner a thief, who eventually went to jail. If Rahu was well placed, the partner could be an engineer working on big machinery but negatively placed it made him a thief. The marriage partner was spiritual, AK in the navamsa 7th, as the partner would go to temple to pray to his deities before going out to commit crime. The navamsa 7th house is showing more the nature of the partner. The story of the partner’s family background will unfold according to the story of the UL lord. Notice that we used Ketu for the UL lord. There are two arudha lords, when an arudha is placed in the signs of Scorpio or Aquarius. Both lords will have an effect. Sometimes just the stronger/most influential planet will give effect. Other times the weaker planet gives its results first, then the stronger planet gives its results. The strength of the UL itself will often determine if the relationship turns into a legal marriage or not. Some serious relationships fail to fructify into a marriage due to lack of strength shown by the UL. Weak placements such as 6th, 8th, or 12th from the UL, curses, bhadak and bad positions can hurt the UL. In the next chart (4th October 1971 @1PM in Townsville, Queensland, Australia), Marriage Refusal, a Hindu woman was going to marry a Muslim but was refused with religion as the reasoning. The UL lord is vargottama and debilitated (which makes it extra debilitated), it is also Venus in the 8 th house of the navamsa (which hurts the significations of marriage), it is also the AK which insures it gives the results indicated. The lord of the UL is not only neecha but it is 12th from the UL itself, indicating loss. The lord of UL positioned 6th, 8th, or 12th from the UL is not good and weakens its significations. Combined with the other factors of Venus, the woman was refused marriage. The Arudha Lagna is 12th from the Upapada Lagna, so the UL rejected her. The Lord of the Upapada is 12th from the UL so the family also rejected the marriage. Though the chart shows she was refused legal marriage, the relationship was a UL because the individuals had real intent to marry. The social planets denied social acceptance of the relationship; the Moon is 6th from the UL and Venus and Mercury are 12th from it. The UL is broken even though there was not a legal marriage, and eighth from it will indicate the next marriage partner. Being that it technically was a UL, the lord of the second, Mars, has raja banga yoga (debilitated in navāṁśa) showing not enough resources to support the relationship. Jupiter placed in the second from UL helped cause the break as well. Jupiter significates religion, and Jupiter is in the badhakasthāna from the lagna showing it causes her obstacles in life, Jupiter in badhaka often indicates religious significations as obstacles. 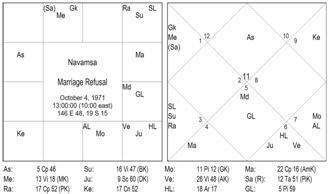 How do we see the longevity of relationship from the Upapada Lagna?though there was not a legal marriage, and 8th from it will indicate the next marriage partner. Being that it technically was a UL, the lord of the second, Mars, has raja banga yoga (debilitated in navamsa) showing not enough resources to support the relationship. Jupiter placed in the 2nd from UL helped cause the break as well. Jupiter significates religion, and Jupiter is in badhak sthana from the lagna showing it causes her obstacles in life, Jupiter in badhak often indicates religious significations as obstacles. Jupiter is also marana karaka sthana from the AL showing she is perceived as hurting religion. The 2nd house from the UL will show the sustanence of relationship/marriage. If the 2nd is strong, even if the UL has malefics (giving a negative relationship) the 2nd house will hold the relationship together. In the opposite case, if there is malefic association in the 2 nd house from UL, it will break the relationship even if it is with a good person and good situation (strong UL). The UL is evaluated to see the situation of the relationship. The 2nd from the UL is evaluated to see if the relationship will last. The next few verses from Rishi Parasara’s Upapada Chapter show this concept in more depth. The amount of verses devoted to the UL is representative of its importance, and with in that is is worth noting the large number of verses on the 2nd house from UL as well. %paêFe iÖtIye=ip SvSvaim¢hs<yute, Sv]Rge tTptaE vaip yÇ k…Çaip ÉUsur. 11.
ySy jNmin yaegae=y< s nrae iÖjsÄm, %Ärayui; indaRrae ÉvTyev n s<zy>. 12. These verses are speaking of the wife as if she dies, but this is in a culture not overly using divorce (though they did have it). These indications for “age of the wife” are to be used for age of the relationship. Longevity relative to the UL is then to be taken as not how long the spouse will live, but how long they will live in your house. Malefics hurt the longevity of a marriage/relationship. A well placed/strong lord of the second from UL will make the relationship last. The sustenance for the relationship will be strong and therefore the union will stay together. Dynamics within that relationship are seen from synestry, but whether the people stay together or not is seen from the 2 nd house from the UL. Parasara gives another shloka, saying what was mentioned later by Jaimini, but adding the 2nd house. He says that a benefic will make the wife sundar (beautiful) placed in the UL or 2nd house from it. Jaimini said the same thing relative to the UL only, Parasara speaks of Sundari (beauty) relative to the UL and the sustenance of the relationship. %paêFe iÖtIye va zuÉsMbxtae iÖj, jatSy suNdrI ÉayaR ÉVya êpgu[aiNvta. 15. There are often only slight differences between what Parasara taught and Jaimini’s upadesa (commentary). After giving the results of benefics in the 2 nd from UL, Jaimini mentions some of the results of malefics. Malefics in the 2nd from the UL will show a relationship not lasting and ending negatively. Indications associated with the UL and the 7th lord will show why and how the relationship is breaking. This leaves an individual with a bad taste for relationship and often they do not wish to get involved again, hence the statement that the individual renounces the world (they give everything to the spouse and run away). Malefics second from UL alone will not make a renunciate. The indications must already be present in the chart for sanyas. When the indications for sanyas are present but the UL is strong the person will get married. If the 2nd house from UL is strong, the person will not be able to get out of marriage, so they are not able to take sanyas. If the UL and its second are afflicted, then the native cannot keep marriage and then marriage cannot stand in the way of renouncing. If the indication for Sanyas is not indicated in other ways, the person will continue with relationship but with another UL, calculated 8th from the previous UL. 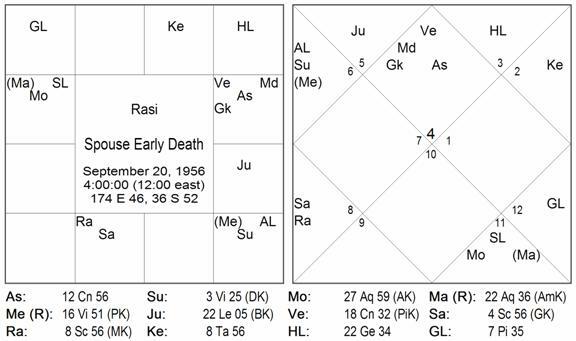 Early death of the UL partner is indicated by combinations for death of spouse seen from the 7th lord and in the navamsa, and the 2nd house from the UL should be connected to the 3rd house from the sthira karaka for spouse (Venus for men, Jupiter for women). This shows that their death is the reason for the ending of relationship. In the example chart is very straight case where the woman has had 2 husband’s die early. When the ninth and eighth lord have association it is a combination for early death of spouse. She has the eighth lord Saturn aspecting 9 th lord Jupiter (so a yoga for early death of spouse is fulfilled). The sthira karaka Jupiter is in the 2nd house from lagna and the UL is in the 3rd house. The 2 nd house from the UL is also the 3rd house from Jupiter. So the end of relationship is also the end of the partner’s life. Sometimes this is only seen from aspects or other type of associations. For example, in OJ Simpson’s chart, the lord of the 2nd house from the UL is aspecting the lord of the 3rd house from Venus. So this shows the end of relationship is the end of life, but not as easily predictable. 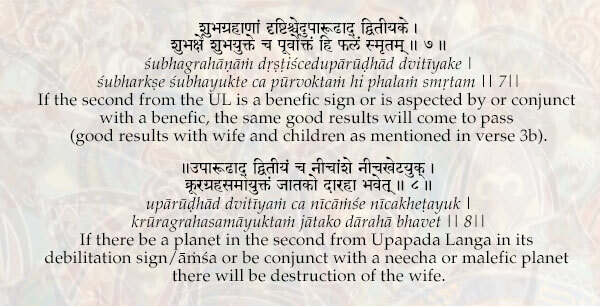 Jaimini reiterates what Parasara said previously, that and an uccha planet 2 nd from the UL will give many wives. This is again a concept coming from a society were divorce was very uncommon and multiple wives was common. The uccha planet is showing the first marriage will not break, and so if another person comes along, the native marries them as well without breaking the first marriage. In Western society, this will have to be interpreted slightly different depending on the belief system of the person, as well as their sexuality (in the Rasi, 2 nd house in navamsa, navamsa trines, and Somanath drekkana). It was believed in Vedic times that either a man or a woman could have multiple spouses, it was not limited to only men. In the Vedas, there are marriage hyms where the prayers are to more than one husband. Later only men could have multiple wives and presently in the westernized world monogamy is the most socially accepted type of relationship. Indications for a sustained relationship are always nice to share with people during a reading. Other times there are malefic combinations that promise a tough end to the relationship. Parasara teaches that the malefic associations on the 2nd house from the UL show the causes and situation of the relationship end. %pvadat! iôySTyagae nazae va jayte iÖj. 16. Jaimini gives upadesa, he first states the same thing but he adds that benefic aspects can mitigate the evil effects. When the 2nd from UL is weak, the relationship will break. When malefics are present they are showing harsh reasons and circumstances breaking the relationship. 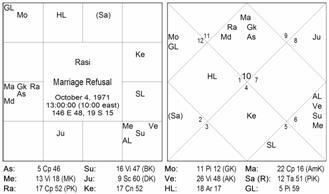 Saturn and Rahu in the 2nd from UL will show death or scandal, calamity or deserting the wife (relative to other indications in the chart). If a benefic is there but the lord is neecha, the relationship may break but the situation will not be as bad. When the relationship breaks the negative indication of the graha will come into the native’s life. When the astrologer sees the negative indications of the planets 2nd from UL coming into the life through dasas, they can also predict that those indications will end the relationship. It is important to take into account the teaching of Jaimini relative to this situation. The problems will exist as the malefics will be in the 2nd house from the UL, but the aspects of benefics will help improve the situation, it will give the partners the ability to work through the situation. This will be very important in showing if a remedial measure to the relationship is possible, and also indicate what that remedy may be. On the other hand, it shows that benefic combinations can be severely hurt by the aspect of malefics. Rasi drishti will show circumstances that are a problem, while graha dristhi will show more the mental issues involved. The sign of the UL is important as well as the sign of the 2nd house from the UL. When these two signs are inimical, there will be a want to break the relationship. 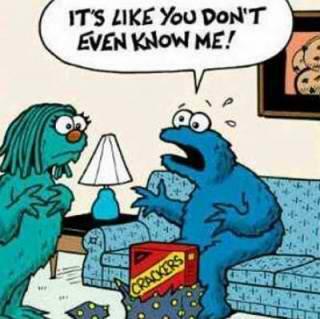 These relationships are already predetermined to be more difficult. Whether they break or not will depend on the condition of the 2nd house from UL. There is an example where of a man who had a Sagittarius lagna, Rahu was conjunct the UL in Aquarius, and Jupiter was in Pisces with the AL. As the planet conj AL and the planet conj UL are inimical, they will want to break up. But as Jupiter is in his own sign in the second from UL he will be unable to break the marriage. The man’s marriage lasted one night, he left her after that, seeing her Rahu nature. But it took 13 years in court to legally end the marriage. Finally the judge just asked the wife if money was the issue and told her the max she could get, the husband then agreed and the marriage was finally absolved. How do we time relationship with the UL? The Marriage should be timed from the Upapada and the 7th house in Rasi and Navamsa. For this information read the paper Sanjay Rath and presented at the New York City Lectures in 2003. What is the situation when a relationship breaks? When the second house from the UL breaks the signifcations of that house will break. If the UL is in the 9th and the 2nd from that is the 10th house. When the relationship breaks the 2nd house from UL will break and all significations of the tenth will be hurt, so the person may also suffer job problems or loss, loss of fame, and status due to the relationship break. If the UL is in the 3 rd, the person may lose their home and all happiness when the relationship breaks. If the UL is in the 4th house, the person may lose the stability of their chitta when relationship breaks, or may lose the bhakti of the 5th house. Some significations will be damaged. If there are planets in the 2nd from the UL, they will show damaged significations with situations related negative significations of those planets at the time of the relationship break. If Saturn and Moon are second from the UL, the person will experience great depression at the time of relationship break. If Mercury is 2nd from the UL, the person’s memory, studies, or business will be severely afflicted. 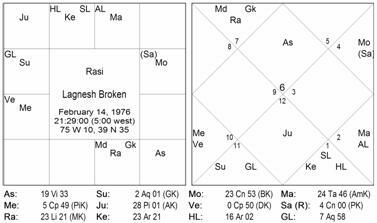 If the lagna lord is in the 2nd from UL, the health will be damaged and the person will fall sick out the time a relationship break. The fundamental concept is that when the relationship breaks, the 2nd house from it is afflicted and any significations related to that house will also show affliction. In the example chart, the native was on his second serious relationship. The first UL was in Taurus, and the 2nd UL was in Sagittarius. In the 2nd house from the Sagittarius UL was Mercury, the lagna lord. When the relationship broke, the native fell sick for some time, this is because the lagna lord had to break when the 2nd house from UL broke. When the relationship breaks, it is because of a weakness of that house and everything there is afflicted. The 2nd house from the UL is also the chitta, the mental state, and the native was very unbalanced for some time after the relationship break. This will help determine Upapadas and also help predict the end of relationship. Benefics placed here sustain relationship, but if heavily aspected by malefics will first give good results that slowly deteriorate. If there are malefics 2nd from UL, it shows negative experiences in the relationship and will make the UL break. If aspected by benefics it will show the ability to overcome these negative experiences and therefore experiences and emotions related to those aspects should be strengthened. If Moon is aspecting a Saturn second from the UL then the person needs to be more nurturing in relationship to help it be sustained. Remember that Sun and Ketu are benefics relative to relationship. Ketu will indicate the need to be more spiritual and indicate bringing spiritual practice into the relationship. The Sun will show Dharma, and the following of a Dharmic path is very important. If the Sun is 2nd from the UL, and the relationship breaks, be sure the person has followed some adharmic path which is helping to break the relationship. An exalted planet generally has more sattva to it. So an exalted Saturn will not break the relationship. Instead it will hold the relationship together with an iron fist, it will not allow the relationship to break. 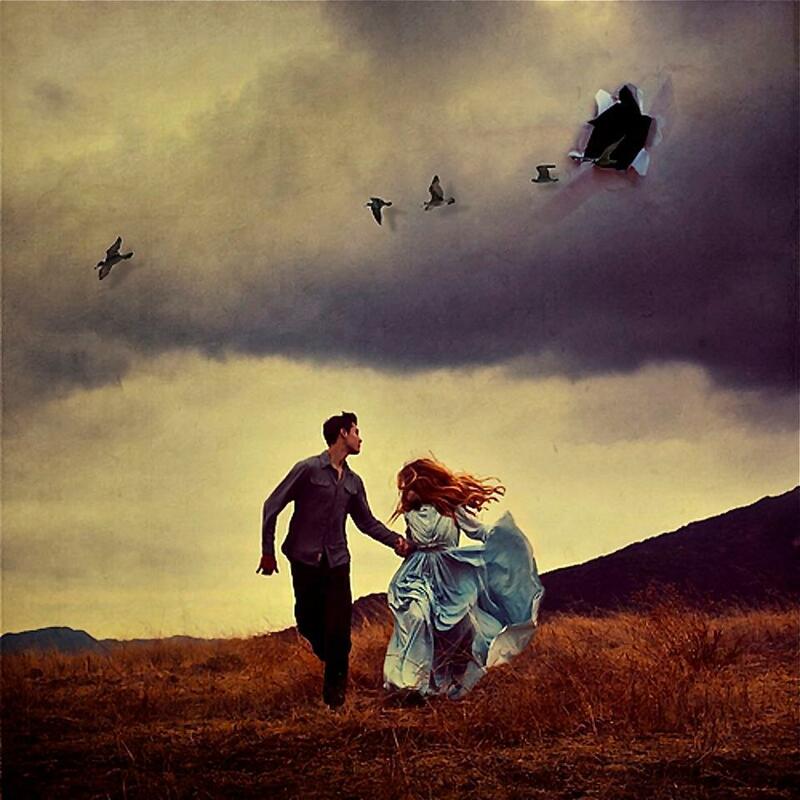 Sometimes a person is trying to leave a relationship but unable to. This is often because of the strength of the 2nd from the UL. If it is strong, the person cannot leave the relationship even if they want to. If the 2nd from the UL is weak the person cannot sustain the relationship even if they want to. When a person wants to break a relationship and cannot, there are various harsh tantric remedies to break the 2nd house from UL. When a person wants to improve a relationship they should strengthen the UL and its second house. How does one match Upapadas for determining a good relationship? The Upapada of the native should fall into trines or the opposite sign from the lagna of the spouse for good compatibility as a marriage partner. The Lagna of the native should fall into trines or the opposite sign from the Upapada of the spouse to be compatible. This gives 4 signs which are compatible for any nativity. If the UL was in Cancer, then Cancer, the other water signs in trine (Scorpio and Pisces) or the opposite (Capricorn) would be compatible lagnas for the spouse. Both the native and the partner should have UL and Lagna compatibility. The planets strongly connected to the UL of the native should match planets strongly connected to the partner’s lagna to show a karmic connection in the compatibility. For example, if the UL is in Leo, with a strong Sun, the partner should have a strong Sun in lagna or trines to it. Some similarity between these points will show a karmic bond that will make the relationship compatible, so that the partners perceive each other as marriage partners. The Arudha Lagna represents externalities, and when the Upapada is trines with the AL it shows the marriage is based on externalities like beauty, position or money of the spouse. It does not show a deep connection, or a happy long term relationship. When the Upapada Lagnas are the same it often indicates an arranged marriage. Larsen, Visti. Kalatrakaraka, Article presented in West Coast Conference, Sunnyvalle California August 2003.